Here are some of my top tips for dealing with picky eaters. Try smoothies. Smoothies are great at hiding a lot of things in, such as spinach, hemp seeds, chia seeds, protein powder, and even green powder. And if you pair it with some frozen bananas it can even take on an ice cream-like texture. If you're kids get a little squeamish with the green color, try adding blueberries to make it more purple and disguise the greenness. And another option to tempt them to eat it is to add some fun toppings like vegan marshmallows, dye-free sprinkles, and even some chocolate chips...cereal is fun too! Try other sneaky foods that pair a healthy or commonly not-liked food with something kids do like: like "Sneaky spaghetti sauce" "spinach pancakes" "red lentil pasta" "cookie dough dip" made from beans, popsicles you make from home with smoothies, veggie-filled "meat balls", chocolate pudding made from avocados, or banana ice cream. Only disclaimer with that is that they don't get used to the actual texture and look of veggies...so Offer fruits and veggies in a variety of formats and flavors. So where as your kids may not like cauliflower raw, they more be likely to take to it if it's roasted and with a yummy dipping sauce, or instead of cooked carrots, they may just like raw baby carrots. Leave some of your meal "plain." As you can imagine recipes with lots of flavors and spices, may be enjoyable to adults, but kids may not find them appetizing at all, and once you lose them on the flavor the chances of them eating any dinner is pretty much out the window, so I like to leave some of my main dish "plain". You can do this by scooping a portion of the meal out before you add the main spices, sauce, or other stronger flavoring options. And then present your child with the option to eat the flavored version of the meal or the plain one. Either way, they are still eating dinner, just in a way that might appeal more to their younger tastebuds. Use sectioned plates to teach kids what a balanced meal looks like. I love these stainless steel trays that I got off amazon with 3 sections, one for the main dish, and two sides. We typically fill the larger of the two sides with a fruit, and the smaller with a veggie. This also helps me make sure the meals I feed my kids are balanced too! Then over time they come to expect that each dinner or lunch, I know I'm going to have some fruit and some veggies, that's just how it goes. If they don't like the fruit or veggie offered, I open it up to them to feel free to swap it for another fruit or veggie they would like to have that they can get on their own from the fridge. Either way they are eating some fruit and veggie each meal so I take it. Fancy up your food presentation, the better it looks the more likely they are to eat it. New silverware, accessories, silicone cupcake wrappers, little forks, etc. Have them help out with the cooking and serving. Although it may not always be convenient for adults, kids usually love helping with cooking. This allows them to help make choices for the meal (these noodles or those), feel a sense of pride and ownership in the meal, and gives them a chance to bond with you. Enforce a "1 bite rule" that kids have to try at least 1 bite of each item at dinner. You could try showing them the Daniel Tiger song, "You gotta try new foods cause it might taste good!" Model for them how you try new foods or taste foods that aren't your favorite by also following the 1 bite rule. Make friends with condiments. still not interested, give them the option to try dipping or topping it with. "What do you think might make this taste better? Ketchup, ranch, bbq sauce, parmesan, hummus, peanut butter? They may pick something random and gross, but let them make the choice because as long as they eat it...who cares?! Last, provide least desirable foods when you know they will be hungry (like after school). I love whipping up some roasted veggies, or a small fruit tray or even a veggie tray for kids that I have available right when they get home from school or right after their nap on the weekends. This hits them at their hungry time and I find they are way more likely to try the veggies or fruit! Give it a try. Still having difficulties, check with your pediatrician to make sure they are growing appropriately and seek help from your the school district you live in. Specifically parent educators (through a Parents as Teachers program) as well as occupational therapists often have a wealth of information on how to help children with oral sensory issues. So those are a few of my favorite sneaky tips and hacks to help with picky eaters. 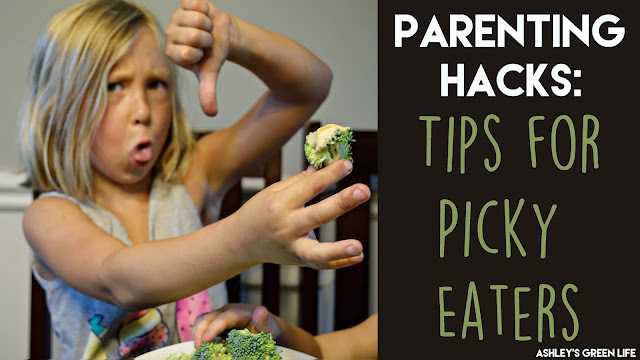 What are your favorite picky eater tips? Share below!